Police surround migrants as they arrive in a facility in Kırklareli's Pehlivanköy which will house migrants scheduled for deportation to their home countries. Turkey's borders have seen a major influx of refugees since a conflict broke out in its southern neighbor, Syria, five years ago. Now, a small border city in the country's northwest is an unlikely hub for migrants for a different reason. Kırklareli, a city of 92,000 people, is home to a refugee center for migrants who will be sent back to their home countries. Syrians, displaced by ongoing conflict at home, are exempt from deportation. Under a deal with the European Union, Turkey started receiving migrants from Greece in return for the transfer of Syrian migrants in the country to European countries on Monday. The deal, which aims to relieve the EU of the refugee burden, first saw migrants leaving for Turkey from the Greek island of Lesbos while Turkey in return had refugees board a flight to Germany. The deal stipulates that Ankara will take back all migrants and refugees, including Syrians, who entered Greece illegally in return for the EU taking in thousands of Syrian refugees directly from Turkey. Yesterday, a group of 31 Syrian refugees arrived to the Netherlands from Turkey as the first group of refugees destined for this country. Kırklareli, bordering Bulgaria, is at the forefront of the resettlement of refugees from Europe to their home countries. The city's governorate recently hosted a press tour for reporters to showcase the Pehlivanköy Resettlement Center, situated in a small town near the city inhabited by former refugees. Located in a lush stretch of land and surrounded by metal fences, the center, opened on April 1, is the new home for nearly 200 migrants from Pakistan, Bangladesh and Afghanistan, as well as two from Syria. After a seven-hour bus ride from Dikili, a Turkish town on the Aegean coast where migrants are being sent from the Greek island of Lesbos via ferry, the group arrived at the center on Monday. More arrivals are expected at the center in the coming days, while no new arrivals were scheduled for yesterday. The center, which has a capacity of 750 individuals, offers facilities as comfortable as those in refugee camps set up for Syrians in Turkey's other cities. It houses children's playgrounds, a hairdresser, sports facilities and more. Kırklareli Governor Esengül Civelek told reporters the facility was prominent among the others with the services it offered. Pehlivanköy is known for its large population of Pomaks, a Muslim community that migrated from neighboring Bulgaria in the last decades of the Ottoman Empire, and is located some 62 kilometers from central Kırklareli, which has been a safe haven for ethnic Turks who fled Bulgaria in the 1980s due to repression by the Bulgarian regime at the time. In the 1990s, Kırklareli was a shelter for refugees fleeing the Bosnian war and ethnic Kosovar Albanians fleeing war in Kosovo. Apart from Kırklareli, Turkey has refugee centers in 16 cities. Those centers have the ability to accommodate 10,950 people in total. Interior Minister Efkan Ala said Turkey was ready to receive 500 people on Monday and that Greek authorities had provided 400 names, although these numbers could change. "Those who are from countries other than Syria, [namely] Afghanistan, Pakistan [and] Iraq, will be transferred to [reception] centers the minute we admit them from the Greek islands," Ala said. After migrants are transferred to these centers, authorities will contact their respective countries, and they will be returned to their country of origin in line with readmission agreements signed with the aforementioned countries, he explained. 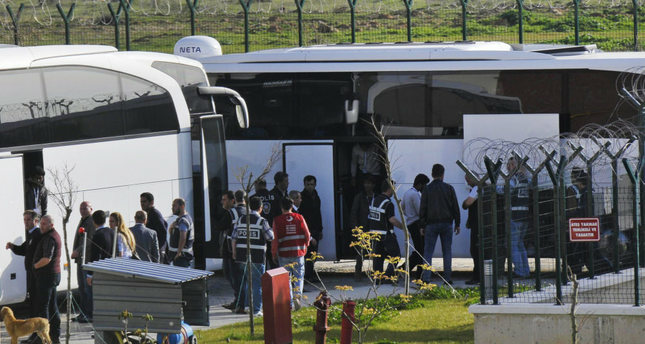 Turkish media reported that Syrian returnees will be accommodated at a refugee camp in the southern city of Osmaniye, and they will be resettled in other camps in the country after a registration process. A Turkish official speaking to Agence France-Presse (AFP) said Turkey expected to receive 200 more migrants from Greece yesterday, again, from Lesbos, though their nationalities were not disclosed. New returns were not reported from the Greek islands as Daily Sabah went to print. Greek authorities said migrants had applied for asylum and asylum requests had to be processed before any new returns to Turkey. Officials said deportations would not take place every day and would depend on asylum application processes. Meanwhile, crossings to the Greek islands by Syrian migrants seeking to reach Europe continued on the first day of the implementation of the EU-Turkey deal. Some 225 migrants managed to reach two Greek islands on Monday. Turkey is home to 2.7 million Syrian migrants whose majority live outside refugee camps. With no end in sight for the Syrian conflict and dim prospects of a return home, Syrians mostly opt to leave for Europe due to generous social benefits and perceived work opportunities.